This page will provide links to our favorite old time radio, tube equipment, and hobby equipment pages, articles and "how-to" pages. This page is dedicated to all those Grandads (and Grandmas) who learned radios in a rougher era. This is the oldest BC-312 I have ever found. The most common seem to be from 1943 and 1944. 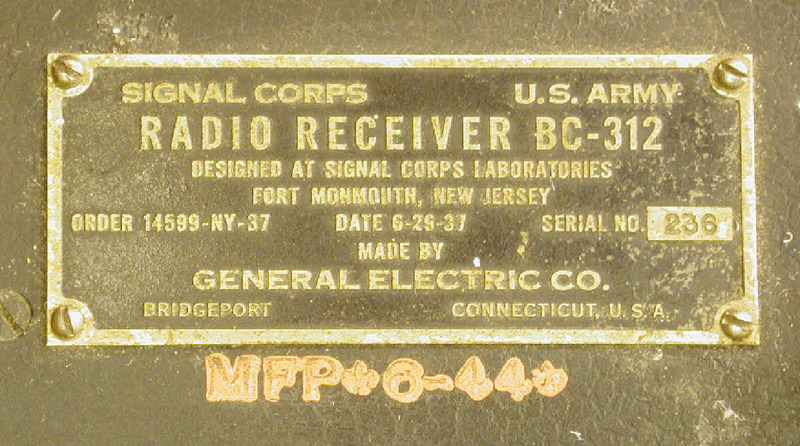 This type of receiver (or its line voltage companion, the BC-342) can be seen in the lower center of the photo above. A detailed close up of the name plate can be viewed here. In the interest of documenting the BC-312 series, as some have for the BC-348, I have started a table of BC-312 and BC-342 that I own as well as other photos of nameplates I have gotten from Ebay and others. The BC-342 was modified for use in OA-65/MRC-2 and OA-65A/MRC-2 and ended its life as an R-336. 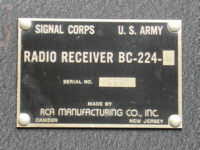 I have BC-224-H, RCA serial number 2207, that I am planning to sell (now on Ebay, 9/4/2011). I took a bunch of photos, here , that you can look at. I have had this radio since 1976. It has been modified to operate from 120Vac, 60Hz. The FT-154, and the correct Jones plug, is in place. 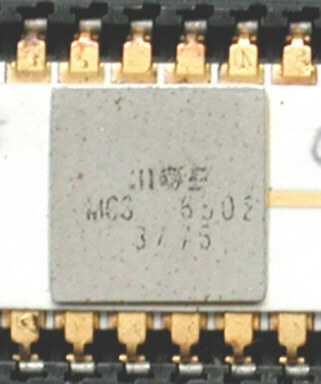 The audio output tube was modified to take the 6K6 octal equivalent of the original. Two holes have been made in the case: one for the power line switch, and one for an RCA phone jack on the back to connect in a speaker. A few caps and other parts have been replaced over the years. It works, but needs an alignment to get all the WWV points exact. The tuning knob is not smooth due to a slightly misaligned/bent shaft. THIS RADIO HAS BEEN SOLD. These radios are often found at flea markets and ham fairs in fairly ragged condition. Sometimes the dial calibration is so badly off that it is hard to hunt the calibration points. To make it easy for myself, I slapped together a small WWV spotter (2.5MHz harmonics), for quick testing. Click thumbnail for schematic. The output is just two wires about 18 inches long, which I dangle close to the antenna input. The modulation is pretty rough, but good enough to get a distinctive tone on the radio. Since even a crummy junk box crystal is almost always better than 0.01%, the calibration error is only 1kHz at 10MHz. 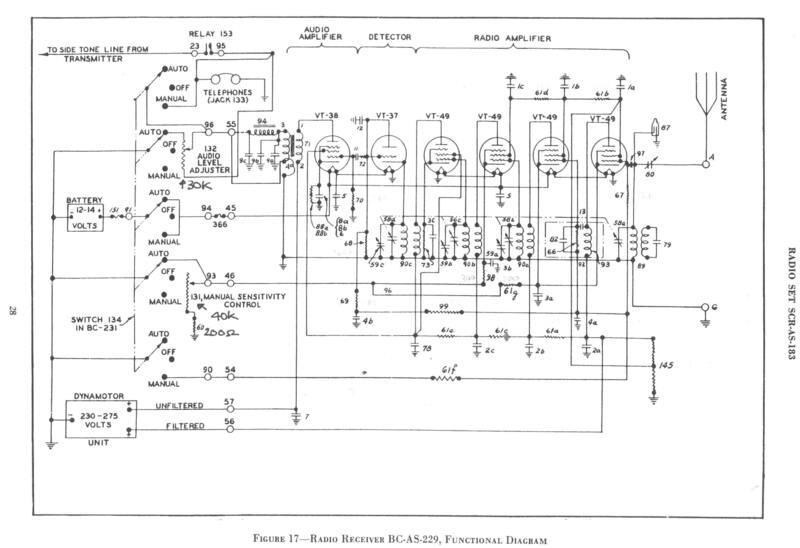 If you click on this photo you'll get a schematic (for RevB: R6=22M, C2=68pF and U1 is a CD74HC00) of the board configured for a 100kHz crystal calibrator, which emulates what a Heathkit or Hallicrafters 100kc crystal calibrator would have done. I have lots of the boards and I planning on making a parts kit. 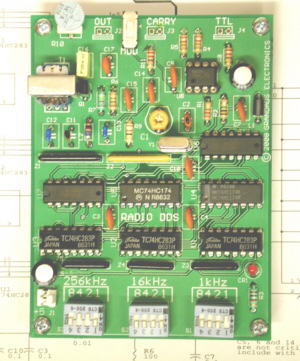 You can build your own by using this manual: (click here for PDF, MO=Mouser, DK=DigiKey). It is set up to be a WWV spotter, or a 100kc crystal calibrator, depending upon parts loading (the kit has only the 100kHz parts). The schematic shows the 100kHz loading. Two AAA batteries mount to holders on the back side and supply enough power to run for about 600 hours (with modulation off). We are selecting the crystals for "pullability," so zero-beat is almost assured with each kit. In the rare case that it isn't, we will send a new crystal. You can purchase by checking our Ebay listing, under "grandadselectronics". Please do not call the sales office, which is for our "professional products" only. 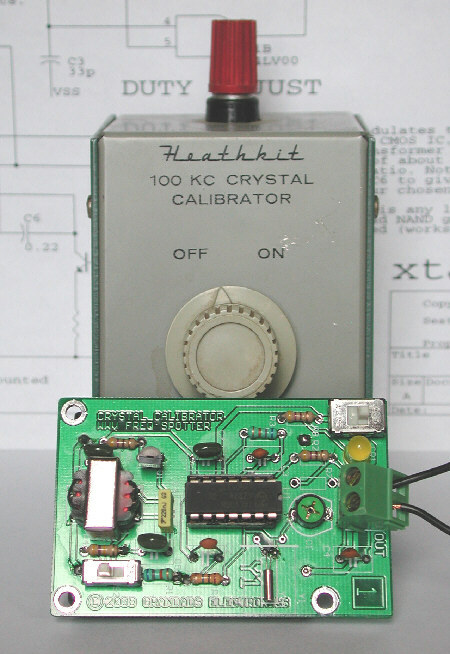 If you want to build a complete "retro" crystal calibrator, using the large style crystals of the past, go to the website of Brian Carling, AF4K, at http://www.af4k.com/crystals.htm. He has 100kHz HC13 and HC6 crystals at reasonable prices. Here's another board I just did. 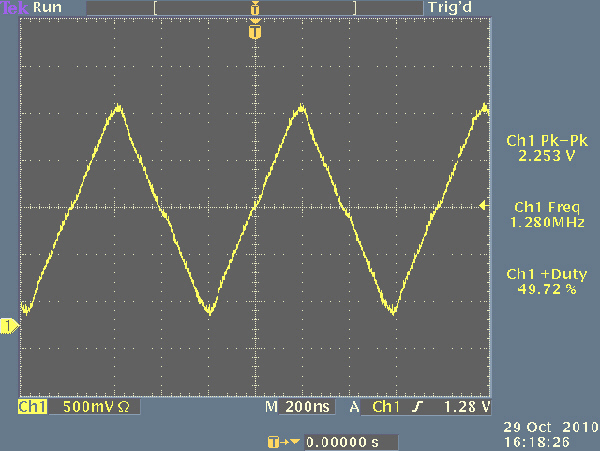 This is a simple 12-bit DDS board which outputs a triangle wave and square in 1kHz steps from 1kHz to about 1.7MHz. 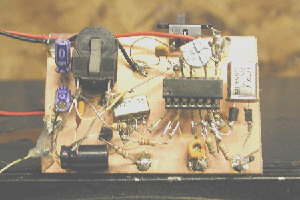 The concept was to build a small circuit, with crystal controlled accuracy, that I could use to align old tube radios. Since radios are narrow band, I decided to forego the sinewave ROM to make the circuit ultra simple, with no custom parts. Everything is available from Mouser or Digi-Key. 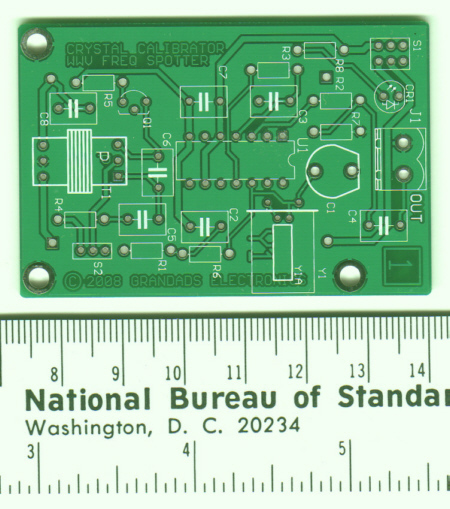 Here is a small photo of the board and a Tektronix Scope screen shot of the outputs at 256kHz. The board is being run from three AA alkaline batteries. You can see the kit contents by clicking this link. Update October 29, 2010: I thought it might be fun to speed up this board a bit. 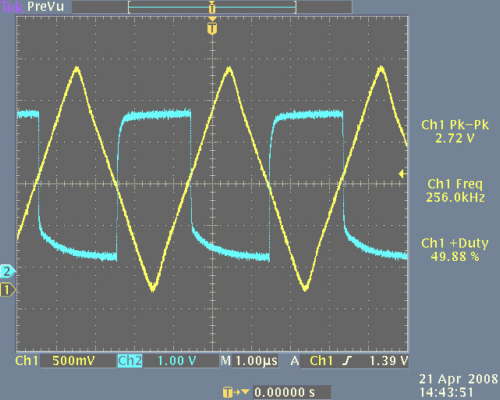 I modified the oscillator to use a 20.48MHz crystals, which gives 5kHz steps. Maximum frequency is now 8.5MHz. I used the same board, with just different parts. This high-speed version needs 5v (4-AA work fine). As soon as we get all the parts, a kit of this will be available. Check Ebay, or send an email (they will be cheaper to get here). Here is the high speed schematic. Here's the output at 1.28MHz (same setting as above, but with new parts). 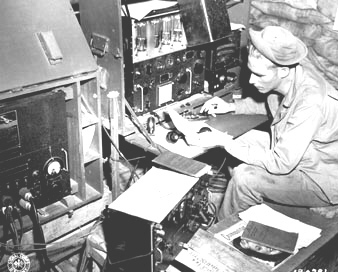 Shortly before and after WWII a modern farm radio design using a 90V "B" supply and a 1.5V "A" supply became somewhat common. Most of these radios used a four tube line up consisting of a 1A7 pentagrid converter, a 1N5 RF pentode, a 1H5 dual diode/triode and finally a power pentode (1A5, 1C5, 1Q5, etc.). These radios were intended for areas without commercial electricity distribution; hence, the farm radio name. 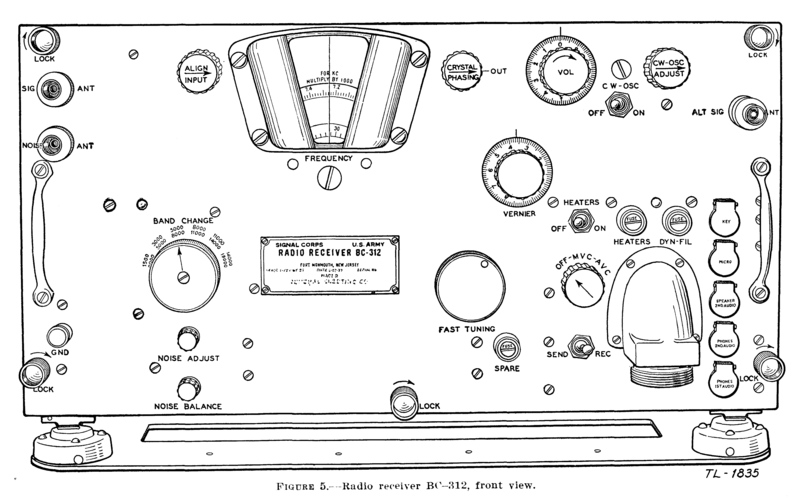 In an effort to play these radios in a manner similar to how they would operate with batteries, the power supply in the photo below was designed. This supply provides highly regulated B+ and A voltages for these farm radios. Please see the manual here for detailed information and specifications. Note that this is a fully isolated, regulated, over-voltage and over-current protected power supply. Click here. Please note that this is for "do-it-yourself" people, we don't supply the kit. Note that lethal voltages are involved, so only use this power supply or your homebrew version if you are familiar with high voltage safety precautions. Check Ebay, seller "grandadselectronics" to see if we are still selling these. In 1939, the 1D8GT, a diode-triode-power pentode tube and the 3A8GT, an RF-pentode, diode and audio triode tube, were introduced. These two tubes replicated three of the four tubes used in the pre-war 1.5V farm radio. What is missing is the equivalent of the 1A7GT (pentagrid converter). Several manufacturers adopted the 1D8 and 3A8 tubes in various combinations with other standard tubes. For example, the Majestic 130 series used the 1A7, 1N5 and a 1D8. This allowed them to build a transistor sized portable radio in 1939. 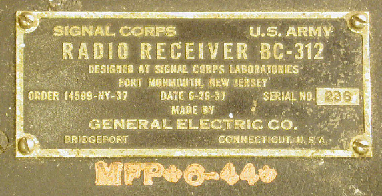 This radio was privately branded and sold in the Spiegel Catalog. Motorola (B-150 and 41H) and GE (HB412) went to a different configuration using the 3A8 in combinations with traditional power output tubes (1Q5 and 1T5 respectively). The Tube Collector's Magazine (http:www.tubecollectors.org) has recently published articles on the 12volt car tubes (12volt plate and filament). I think they would make a nice version of this radio. I might give it a try. You can see the schematic here. Any set of battery tubes can be used in a similar fashion. If you look at the 1U4 and 3V4 miniature battery tubes, you can get almost as much gain as with the 4-tube equivalent. As built, I can get about 10 stations at a comfortable listening level and reasonably low QRM. It is not a DX set and doesn't have enough selectivity for close-in stations, although it is good enough to separate KJR (950kHz, sports) and KOMO (1000kHz, news) at my location. You can see the schematic here. You can see how I parsed the manual and came up with a test bed here and here. Several years ago a research project I was working on required extensive travel to Europe. While there, I purchased a radio controlled clock which was synchronized and set by receiving the LF signal from DCF77 in Germany at 77.5kHz. This worked fine when I was in Europe, but the signal is impossible to receive in the Pacific Northwest. At about the same time I began using a Hameg HM 8125 GPS receiver that has a simulated DCF77 time sub-code output. To be able to set the clock from this digital signal I came up with the circuit shown in this PDF file: Dcf77.pdf. It was cobbled with parts I had stashed in the junk box. Since then, I have exhanged emails with other interested parties that had similar needs, but without access to a fancy GPS receiver. Thanks to Tom, at www.leapsecond.com, who provided a nice windows based program, and the encouragement of Pierre in Montreal, I updated the schematic to use a PC generated bit stream. 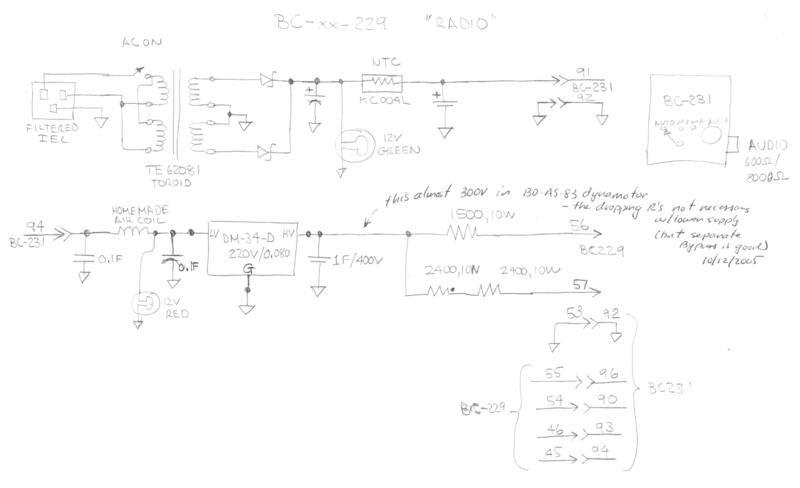 This is not nearly as good as a GPS receiver, but if you find yourself far away from Germany with a DCF77 clock, you can use this circuit and code to set it. This is obviously for the experimenter. There are two small executables you can download and run in a command window. 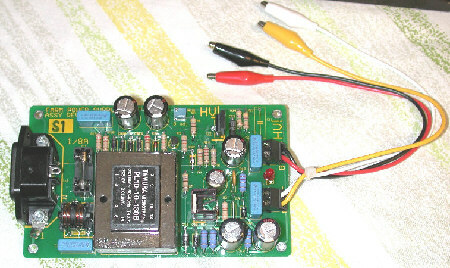 http://novatech-instr.com/Fun/timet.exe which gives a rough estimate of your computing overhead and http://novatech-instr.com/Fun/dcf1_sds.exe which communicates to the updated modulation circuit via a serial port. You will need a USB to serial adapter if your PC doesn't have a serial port. 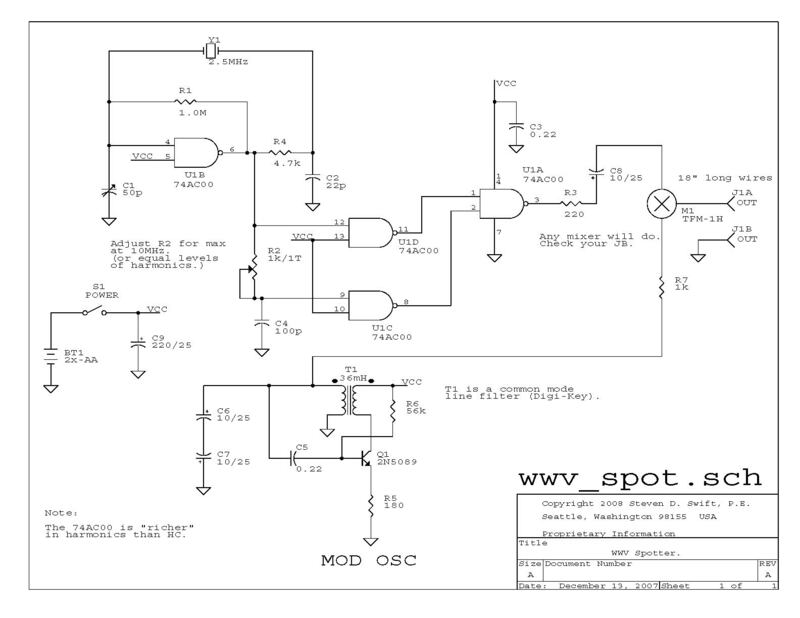 The updated schematic is at: http://novatech-instr.com/Fun/dcf77_m2.pdf. Feel free to experiment. You can get all the parts at Digi-Key. If there's lots of interest I can get a board made. One note: I have found that the fudge factor is as critical as the crystal frequency. My DCF77 clock will tolerate +/-10Hz on the 77.5kHz, which is wider than the crystal error, but won't tolerate a 0.2% error on the fudge factor. Your clock may require you to have significant trial and error to get it set. The "timet.exe" gives a starting point. If you have a frequency counter, just fiddle with the fudge factor until you get a 1 second period on the time output. Another experiment that I did was to replace the crystal in the Radio DDS board mentioned above with a 2.048MHz unit. This allows 500Hz steps, so I can just set it to 77.5kHz (or 60kHz, etc.) and use it rather than the little crystal oscillator. Note that my circuit is functionally equivalent to the circuit put up by Paul Lenz at www.lenz-online.de. There's no reason why the code at www.captain.at won't work with this circuit. Let me know how your experiments go. I am mostly an Analog Circuit designer, but when I was a newbie at John Fluke Mfg. Co., Inc. in the mid-70s, microprocessors were the hot technology rage. My business unit was using the Intel 4040, while other groups were using the 8080. Since I was working on small products we started to investigate the concept of "microcontrollers" and "microcomputers." While the digital and software guys started to home in on the Fairchild F8 and its sibling, the Mostek 3870, (which was eventually used in the 2180A and 2190A series of digital thermometers, controlling my A-D). I decided that I needed to learn more about this technology. To get started, I called a bunch of Fluke vendors to see what I can get as free samples, as this stuff was really expensive back then. 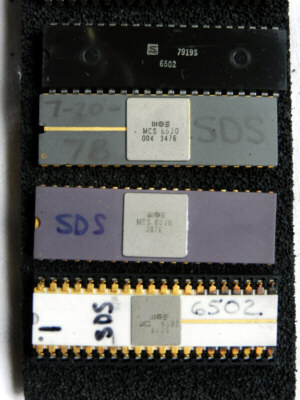 I ended up with the discards from the hardware guys who decided not to pursue using the MOS Technology 6502 series. I got some chips (see photo). Things would often "go missing" from the lab, so I wrote my initials on the parts (which probably ruins them as "collectibles). 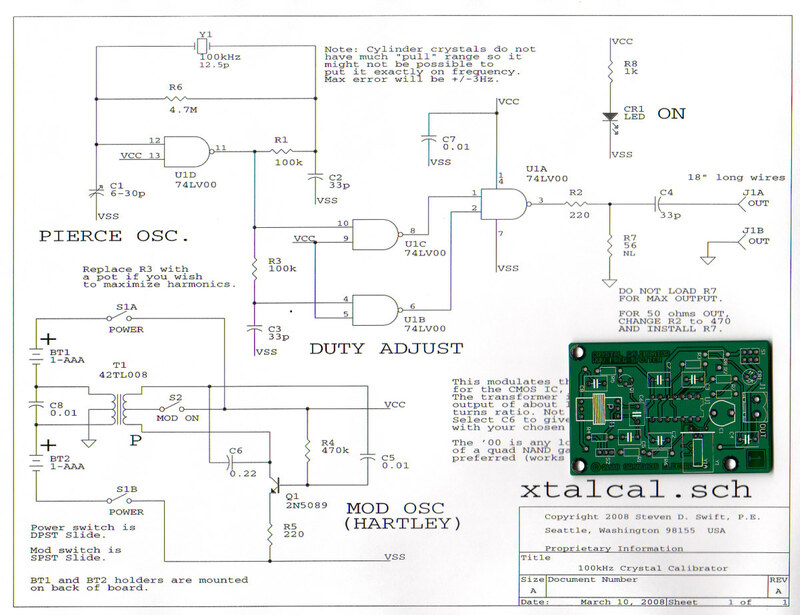 MOS Technology provided a schematic for what they called TIM (terminal interface monitor), which you had to build yourself. I used wire-wrap as all the tools were available to me after hours. I eventually reworked, rebuilt, and redesigned TIM to include 64k of dynamic ram, FOCAL (see the Wiki page: "Focal (programming language)") in ROM, resident assembler, and a floppy controller. 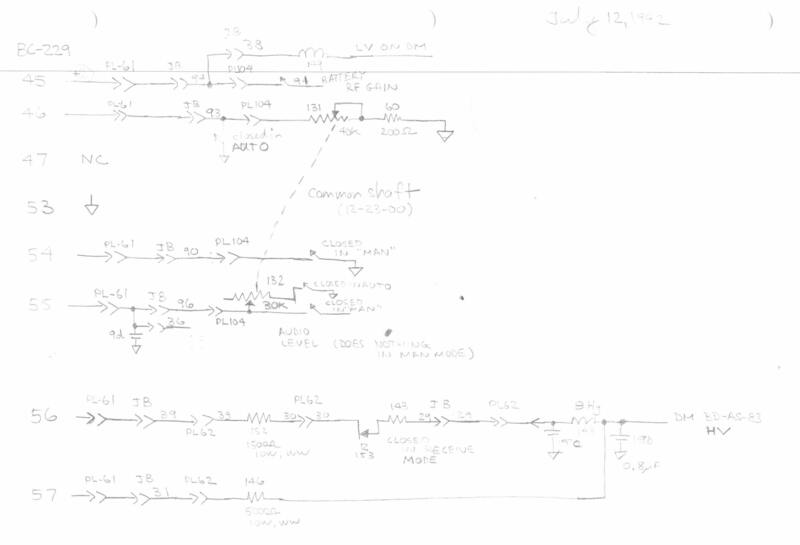 I used it as a development system for my 1979 thesis from the University of Washington. I moved the TIM code up to top of memory and put it into a 2716 eprom. I used Tom Pittman's Tiny Basic (Itty Bitty Computers) for simple programs. 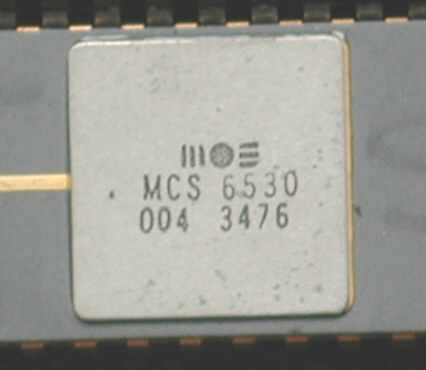 Here are close up views of the original MOS Technology TIM ROM and the 6502 CPU.